Diuretic to dispel dampness in edema, ascites, water diarrhea and wind damp bi syndromes. Heaviness in the limbs and a superficial edema that comes and goes. 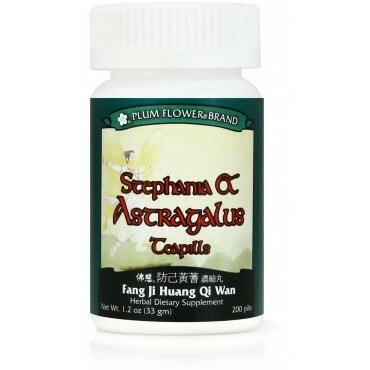 Edema due to climatic influences, nephritis, congestive heart disease and ascites due to liver cirrhosis are some of the imbalances satisfied clients have used this product for. Eliminates Damp, Frees and Benefits the Movement of Water, Tonifies the Qi, Strengthens the Spleen, Expels Wind-Damp, Promotes Urination, Benefits Movement of Water and Disperses Swelling. Astragalus membranaceus root, Stephania tetrandra root, Atractylodes macrocephala rhizome, Zizyphus jujuba fruit, Zingiber officinale rhizome-fresh, Glycyrrhiza uralensis root. - Huang qi, Fang ji, Bai zhu, Da zao, Sheng jiang, Gan cao.